Lock in a great price for Luna Palace – rated 8.5 by recent guests! Very comfortable king bed. Reading lights! Gorgeous heated pool. Wonderful staff. Pretty much everything. 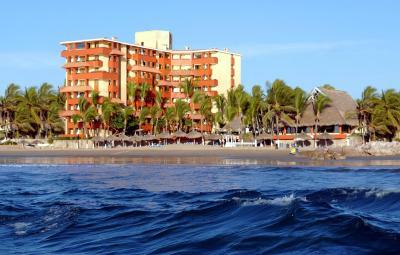 The price, location, staff and an overall great place to stay in Mazatlan. Smaller hotel size, every room had a private balcony and ocean view. Especially liked the quiet nights and comfortable bed for sleeping. Very functional kitchenette so we could eat in when we wanted to. Such a welcome thing to stay in for morning coffee and fruit, well rested, on our ocean view patio, after suffering elsewhere with noisy music going all night! Not here...you will sleep! Just the sound of the waves, lovely morning beach walks. Rooms were very clean. Maids did a great job. Staff was very accomodating whenever we asked for something. Loved the heated pool. Loved that every room is ocean view. A lot of the staff spoke English. Beach was excellent. Many activities to do. The activities personnel was a plus, very intisiastic people. Super nice. Great eating all around within walking distance. Can walk long distances on the l overly beach. Great ocean views! Staff super helpful and friendly. Great location right on the beach. Nice pool area (we did not use). Luna Palace This rating is a reflection of how the property compares to the industry standard when it comes to price, facilities and services available. It's based on a self-evaluation by the property. Use this rating to help choose your stay! 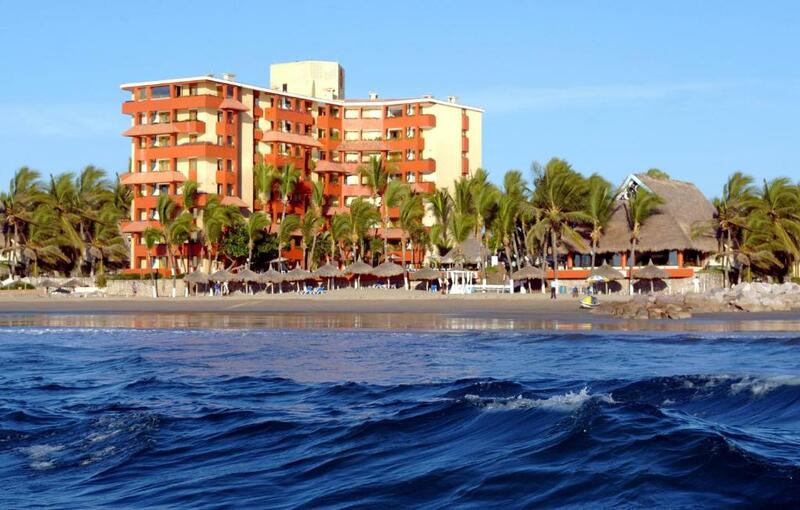 Ideally located directly on the beaches of Mazatlan, this all-suite hotel is close to many main points of interest and features friendly service, complete with many of the comforts of home. The Luna Palace is conveniently located within walking distance to many attractions and sites. The city's local shops, delicious restaurants, entertainment, golf courses and an exciting nightlife are in close proximity. Guests at Luna can enjoy private balconies and terraces, a spacious swimming pool, and fully-equipped kitchenettes in each guestroom. When would you like to stay at Luna Palace? This studio features a balcony, sea view and toaster. This studio has a balcony, stovetop and microwave. House Rules Luna Palace takes special requests – add in the next step! Luna Palace accepts these cards and reserves the right to temporarily hold an amount prior to arrival. There really wasn’t anything we didn’t like. Good locations. Many nearby restaurants and shops. On bus line. The lounge chaises need to be replaced. How kind the front desk and bellman Jesus were. Easy access to palapas....not having to get up at 6am to 'reserve' one. Food and drink service was excellent. This place has amazing value for they money, but don't know if the incredible room rate that I got will ever be available again! Especially with the posted rate at the front desk being 4 times higher than I paid. The wifi could not support my phone or tablet unless I was on the balcony. Could not load Netflix to watch movies on the tv. Possibly our room location from the router? Or maybe not enough bandwidth to support? This small hotel was great! Located right on sandy beach. Lovely pool. Decent cooking facilities. Great bargain overall. Music at the pool was too loud. The restaurant wasn't particularly good. This room was a temporary room until a larger room came available. Beautiful beach, much to do in the immediate area. Service was great and food was good at the restaurant but we learned to check the “la quinta” before paying.